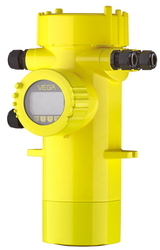 A radiation-based sensor, the Vega POINTRAC 31 has been designed for universal level detection of liquids and bulk solids. The POINTRAC 31 monitors reliably the limit level in vessels, independent of the mounting location. The sensor can be used for applications in all industries. Due to the high sensitivity POINTRAC 31 is an economical solution with minimum radiation activity.